The gray-haired man moved slowly down the streets of his adopted home of Tallahassee, stooped and using a cane to aid his steps. His beard flowed across his thin chest, draping nearly to his waist, and tinged the same gray-white as his hair. His slow journey would take him across the small Capitol town, his home near the railroad tracks lying at one end of the path and a plot in the Oakland Cemetery at the other. 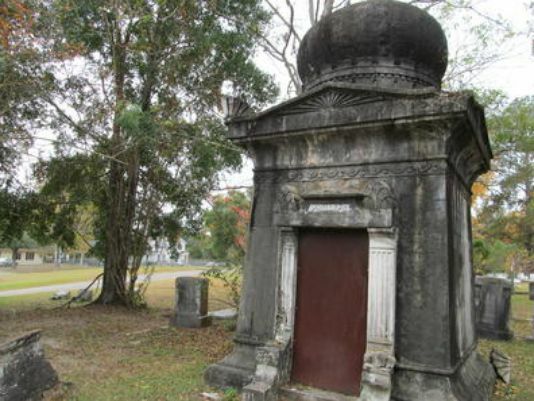 The plot had been bought in 1907, soon after his arrival in Tallahassee, and along with the design and construction of his home, the frail man would spend almost a decade in erecting a mausoleum beneath the trees in the cemetery. Reclusive, he lived like a shadow amongst the farmers and politicians of his new home. Over seventy years later in 1985, the former governor of Florida, LeRoy Collins, would write of him,"No one recalls ever seeing Phillips in a bank, post office, church, school or other place where groups of people normally would gather." Continuing in his article from the Tallahassee Democrat, Governor Collins wrote, "The only person in whom he would confide anything about himself of his interests was his lawyer, State Sen. William C. Hodge, who was committed by professional standards not to divulge his confidences. Upon the elderly man's death in November, 1919, his frail frame was placed into a handmade Cherry wood coffin he had constructed himself and then interred in the completed mausoleum he had labored to build. 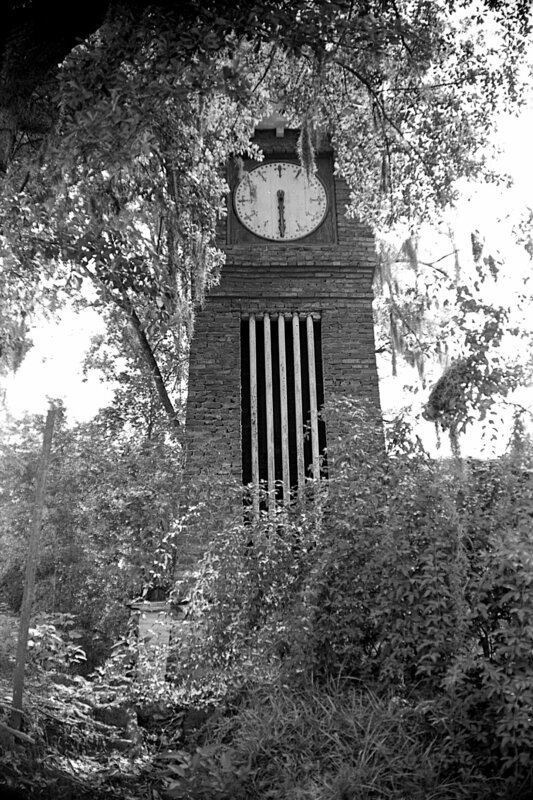 At the nearby Capitol complex the flags were lowered to half-mast as a token of respect to one of Tallahassee's most unique members but within the space of few months, the mysterious gentleman named Calvin C. Phillips faded into the lore of a Southern town. 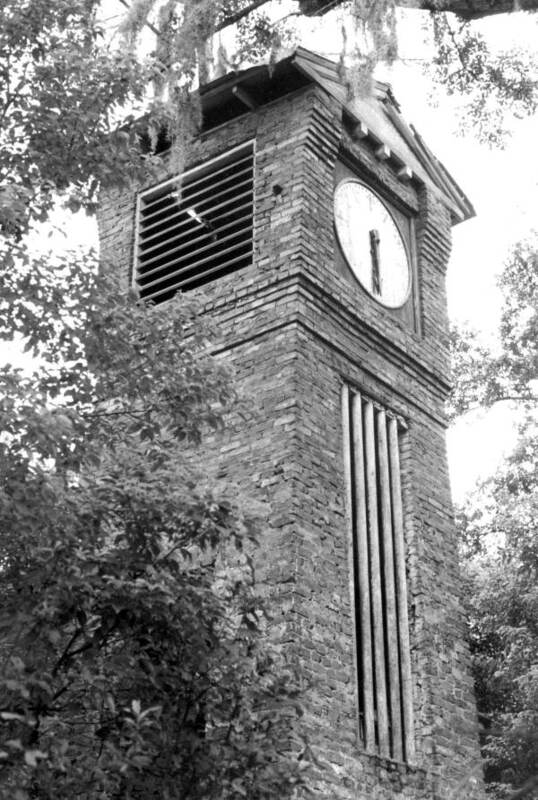 Today little remains of his story, a clock tower he built and his home were demolished in the early 1980's and his mausoleum is considered haunted, visited only by those hoping to glimpse something otherworldly near its walls. In 2000, one of the visitors entered and broke into the coffin removing Calvin's skull and allegedly scrawling the number 322 onto the nearby wall. Finding the vault open the next day, an investigation was launched but the case remains unsolved to this day. So who was Calvin C. Phillips? 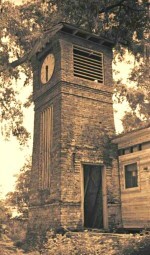 Articles and research by the city's newspaper, The Tallahassee Democrat in the 1970's and 80's found little information about his life prior to arriving in his adopted home. Despite living for over 30 years in Tallahassee myself, I had never heard of Calvin's home or life. My knowledge of him was limited to the tales circulated at Halloween about the spirits lurking near his tomb or in books like "Weird Florida". Calvin's story may have been left untold but for a single comment made by a former Tallahassee Democrat photographer whom I had contacted in the early part of 2016. The photographer, Ray Stanyard, had been involved with a January, 28, 1978 article during which a Florida State professor named Laura Jepsen was interviewed about her unusual home. I contacted Mr. Stanyard in hopes that he might remember something of that long ago winter day that might aid my research into Laura's life. 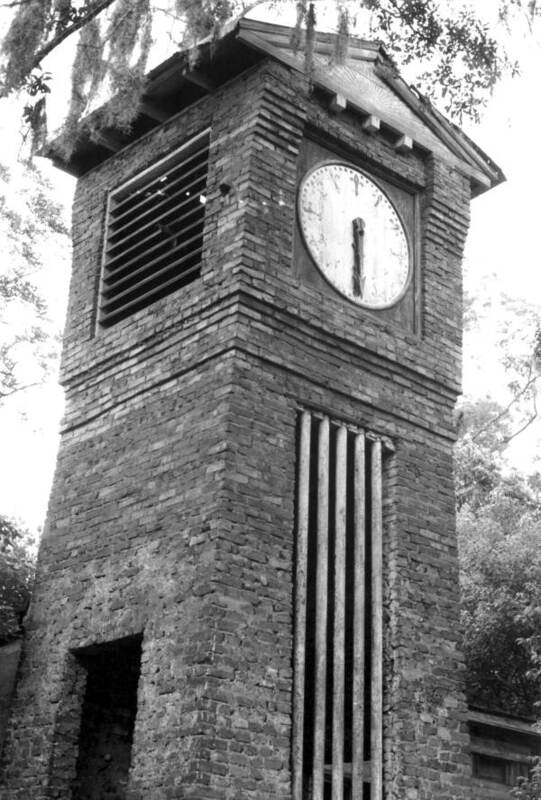 Though he remembered little of that day, toward the end of the conversation he asked if I knew of an old abandoned clock tower that had once risen over the Gaines Street area. 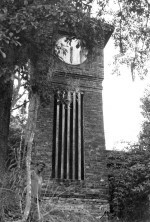 When I expressed surprise at this forgotten, and to me, unknown piece of architecture, he told me of photographing it shortly before it had been demolished sometime in the early 1980's and suggested I look for pictures of it on the Florida Memoryweb site. 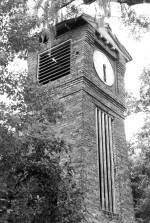 Within a few minutes I was looking at color and black & white pictures of a two-story tower constructed of brick with a three foot clock face at its summit. Trying to find out more about its builder and owner, I began work uncovering the life of remarkable yet reclusive man of the early 20th Century. The following timeline and accompanying notes represents the most complete story of Calvin C. Phillips life and accomplishments available. There are still portions that may still yield to further research but I believe that this is nearly everything that can be found and provides a picture of a complex, intelligent man who may have followed a bit in the footsteps of Mark Twain in embellishing his past for the few that fell into his orbit. 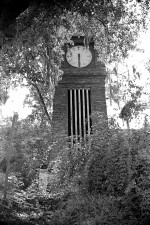 Pictures of the Clock Tower that once stood at the northwest corner of Calvin's home, all of these photos are courtsey of and can be found at the Florida Memorywebsite. 1834 Probable birth date based on census records. 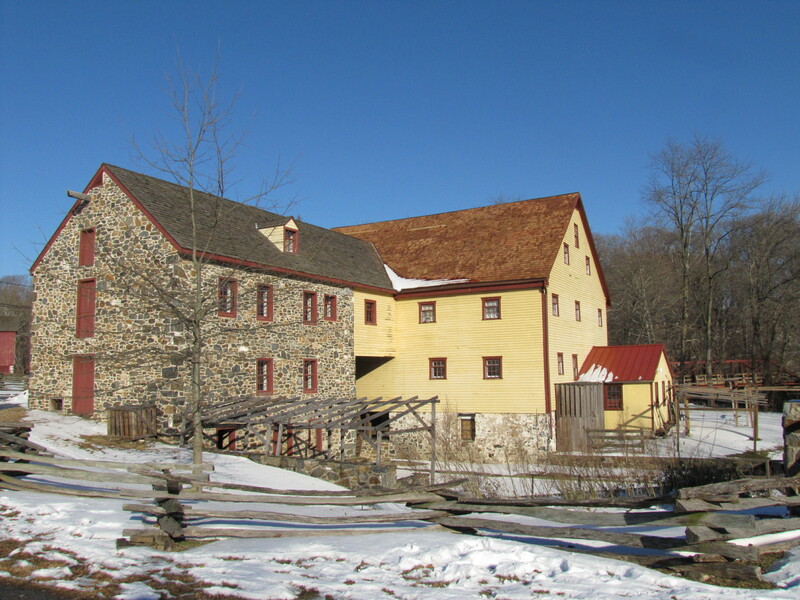 1852 Mentioned in an article about the Greenbank Mill located in New Castle County, Delaware. 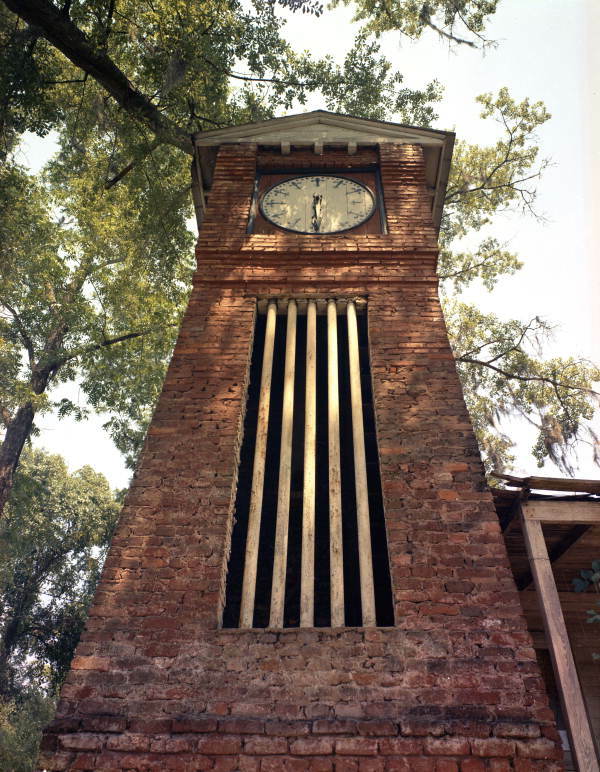 Greenbank operated as both a sawmill and grist mill, purchased b y an ancestor of Calvin Phillips in 1773. 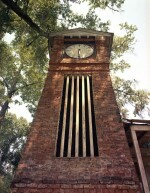 This mill was owned for a time by Calvin and his brother and served as the school where he would learn many of the skills he utilized in his life. Part 1of the article tells of the early history of Greenbank Mill, Part 2, page 2 tells of Calvin leaving New Castle for Philadelphia in about 1852. 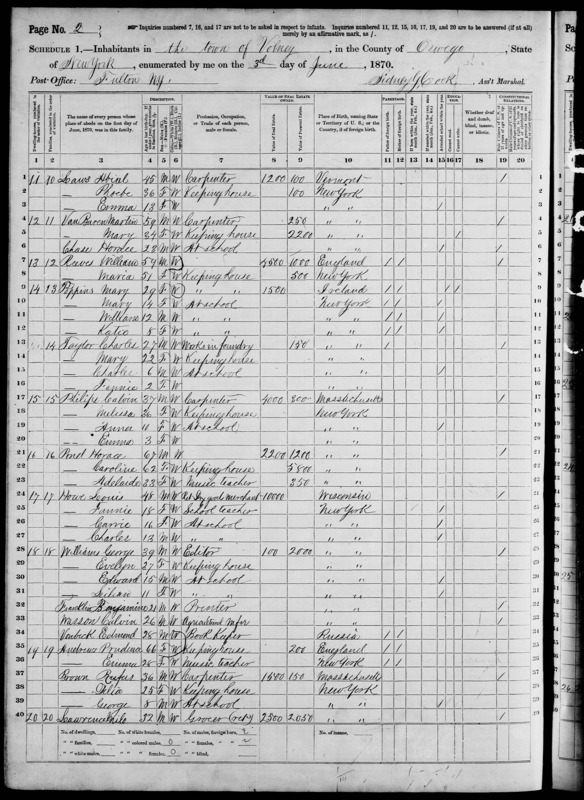 1860 Appears on first census, listed as Head of Household, occupation Master Carpenter living in Schroeppel, NY with wife, Melissa and daughter. 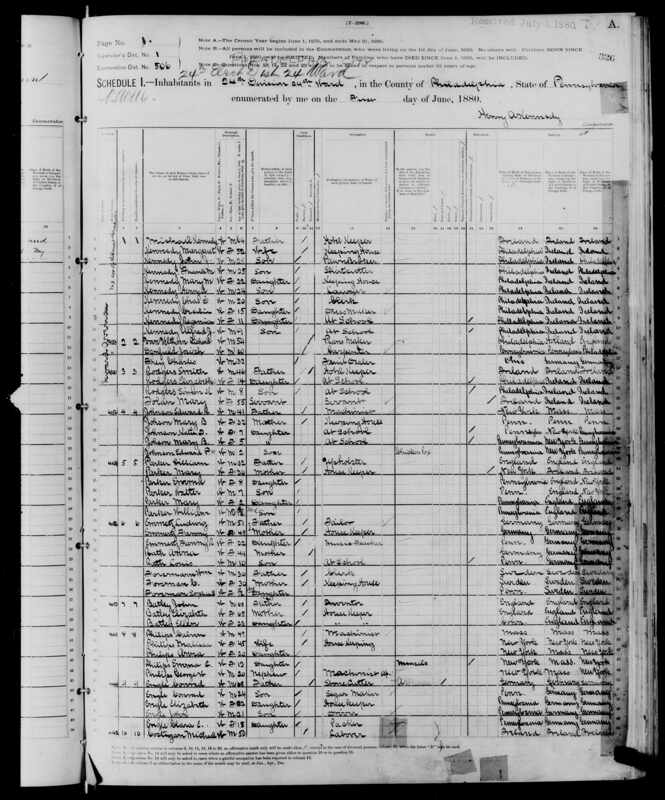 1865 Listed with wife and daughter in New York Census, living in Palermo, NY. 1866 Appears in the Child's Gazetteer & Business Directory of Oswego, N.Y. 1866-67. In the publication he advertises as being a Millwright and Builder in Gilbert's Mills saying he has long experience at his profession. Includes ad for manufacture of lumber and staves of superior quality. Special thanks to Jahongir Usmanov for this information. 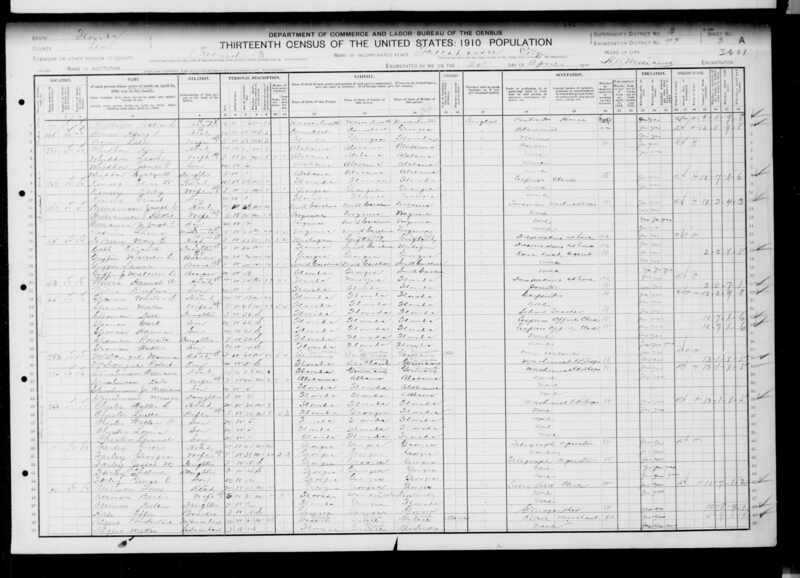 1870 Appears in the 1870 Census, wife and two daughters listed, occupation is Carpenter, living in Volney, NY. 1873 Listed as one of the original members of the Apollo Club of Boston. This is very confusing entry, it appears that C. C. Phillips was a member of the Apollo Chorus of Chicago, also referred to as the Apollo Musical Club. 1876 Sells a piece of property in Oswego, N. Y. Special thanks to Jahongir Usmanov for this information. 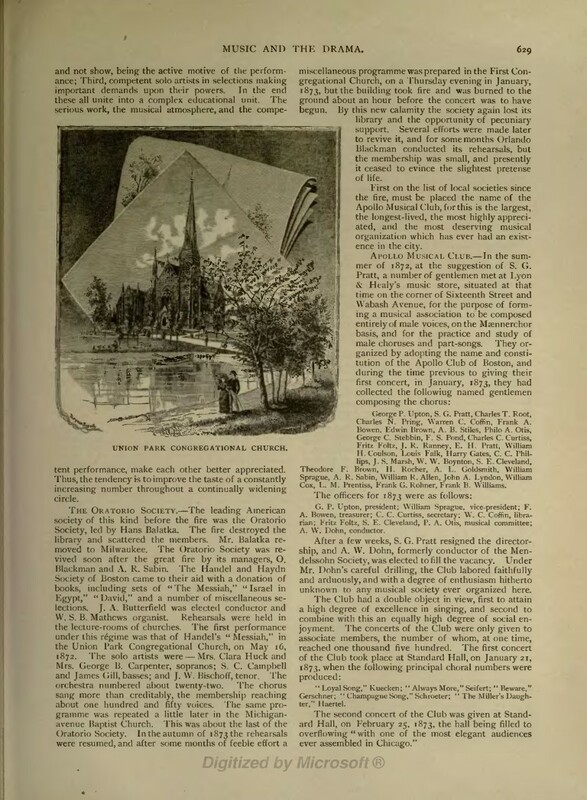 1876 Extract from his biographyon American Architects and Buildings, "The first indication that Phillips is connected to Philadelphia occurs at the time of the Centennial Exposition of 1876. 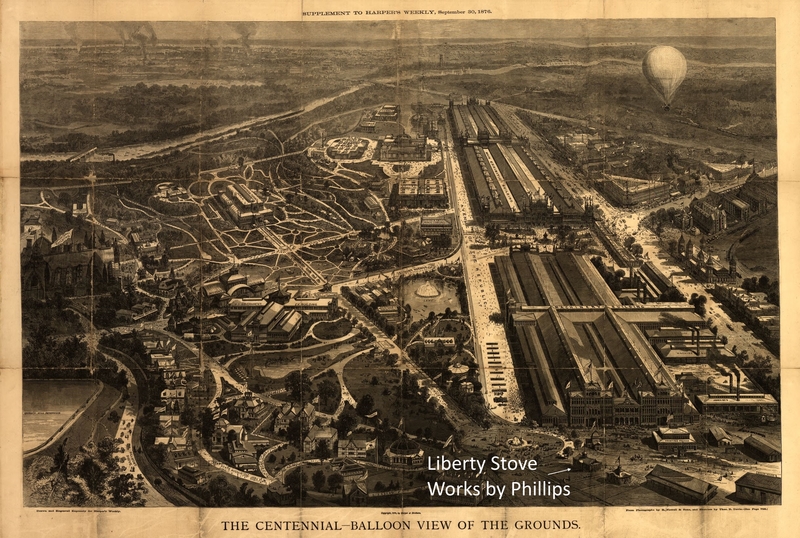 In the listing of exhibitors created by the Pennsylvania Board of Centennial Managers (Pennsylvania and the Centennial Exposiition., 1878, p. 201), Phillips's name appears with a notation of a Philadelphia office and a listing that indicates that on the Centennial grounds he designed the "Liberty Stove Works Building." Immediately following this notation on the list of exhibitors is another for the C.C. Phillips & Co., also Philadelphia, which has exhibited a set of "varnish and japans, " paints, in other words." Note: Page 310 of "Memorial of the International Exhibition published in 1877 indicates that a Chas. C. Phillips was the person associated with the varnishes, not Calvin C. Phillips. 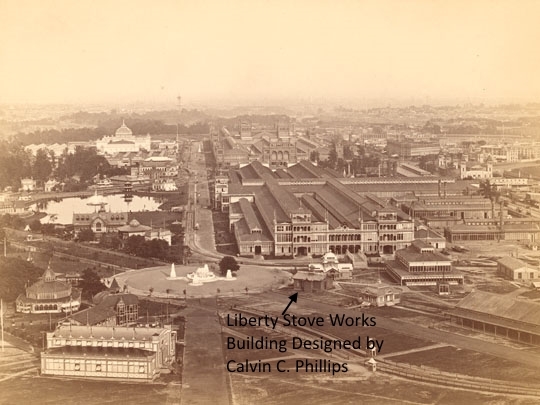 Calvin is however the likely candidate as the architect for the Liberty Stove Works Building, appearing on page 825 of the "Official Catalogue of the U. S. International Exhibition" 1876 as such. 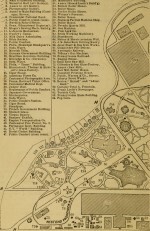 The map to the left lists the Liberty Stove Works as Number 78. The pictures to the right are the only two pictures of how the building appeared. A description of the building's interior and exterior can be found on pages 728-729of the "Memorial of the International Exhibition". 1878 January 5th, ad for C. C. Phillips Vertical Mill appears in the issue of Scientific American, listed as advertiser in the January 12thedition, January 19thedition, January 26thedition, address is for West Philadelphia, PA.
1878 Receives patentfor Vertical Grinding Mill, granted February 19, 1878, Patent #200567. 1878 Appears in the March 30thedition of Scientific American under List of Inventions, Letters of Patent granted, received a patent for a mill, granted week ending, February 19, 1878. 1878 May 11th, ad for Burr Mill patented by C. C. Phillips appears in Scientific American. May 25thissue shows Calvin in the Table of Contents, an article about his improved grinding mill with illustrationand advertisementfor the mill. The mill was capable of mounting up to a 22 inch French Burr, (a type of millstone producing a whiter flour), producing up to 75 bushels per hour of ground grain when operating. 1878 Final ads appear for Calvin's Burr Mill, June 8thand June 22ndeditions of Scientific American, ads cost 75 cents per line. 1879 Biographynotes that Calvin Phillips won two medals in his life, "The first medal of 1879 was awarded by the Pennsylvania State Agricultural Society for Phillips's design for a portable grist mill." An example of this silver medal can be seen here on the right. 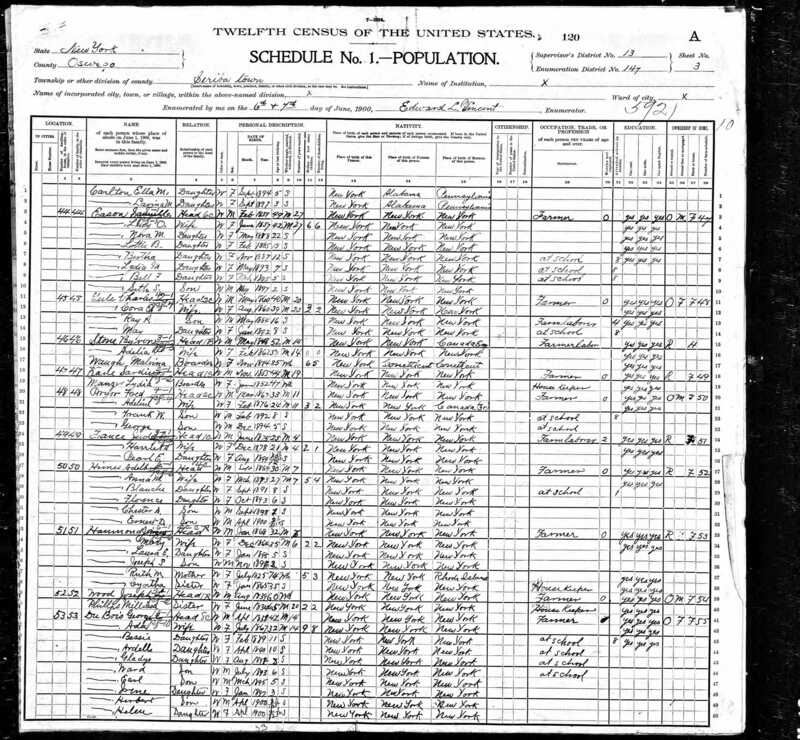 1880 Appears with wife and one daughter in the 1880 Census, occupation is Machinist, living in Philadelphia, PA.
1880 Ad appears in The American Agriculturist for C. C. Phillips Burr Mill. 1887On October 12, 1887, Calvin is listed visiting old friends in New Castle. Mention in New Castle News newspaper for that date. 1887 Appears in The Lakeside Annual Directory of the City of Chicago, listed as having a residence and as a Fire Insurance Broker. 1889 August 6th, receives Patent number 408515 for a mill to crush bones & minerals. 1889 Is an exhibitor in Class 50, Apparatus and Methods Used in Agricultural Workand Food Industries, and Class 52, Machines and Apparatus of General Mechanicsat the Universal Exposition of 1889 at Paris, wins bronze medal in Class 50. This is one of the two medals interred with Calvin at his death. An example of this medal can be seen on the left. 1889 Biographymentions two residences he had completed plans for, "a residence for Clarkes Phill ips, Esq., in Gilbert's Mills, Oswego Co., NY, and has also completed plans for the Hoopes residence in Media, PA." Of these two, the Hoopes Residence in Media, PA appears to have been constructed and still stands. Contact with the Media Historical Society resulted in a mapped location, 1889 Map, 1892 Map, Google Satellite View and Street View. 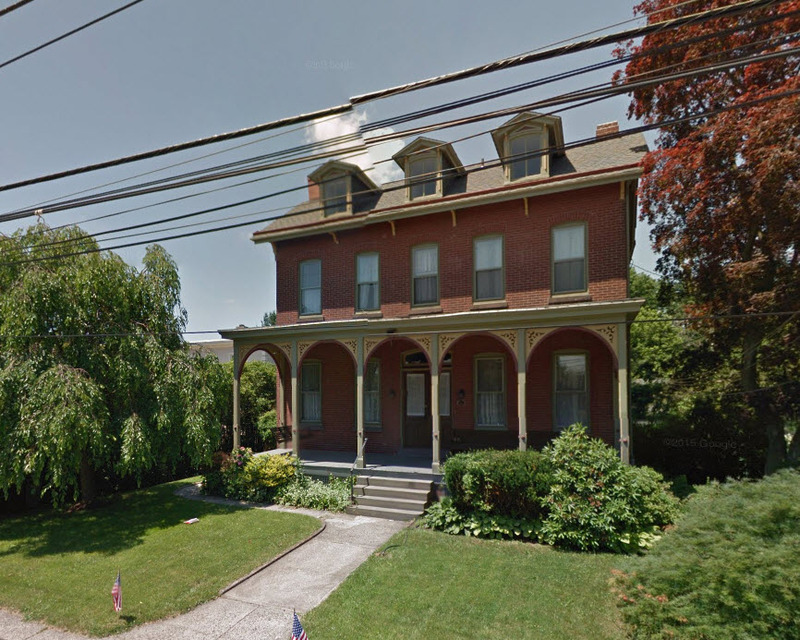 This home is located at 302 South Orange Street, Media, PA.
1890 - 1891 Biography mentions listing of office in Philadelphia, PA, "Phillips appears in the Philadelphia city directories as an architect from 1890 to 1891, with an office at 20 South Broad Street", also there is mention of a building he was completing plans for, "Phillips has completed plans for a Presbyterian chapel to be erected on Elm Street, south of Paschal Street", unknown whether this building was ever constructed. 1891 Appears in the 1891 edition of the Farm Implement News Buyer's Guide, published in Chicago, address for C. C. Phillips is in Philadelphia. In this edition C. C. Phillips is shown selling a Paint Mill, and Grinding Mills using French Burrs, for crushing bones and cobs. 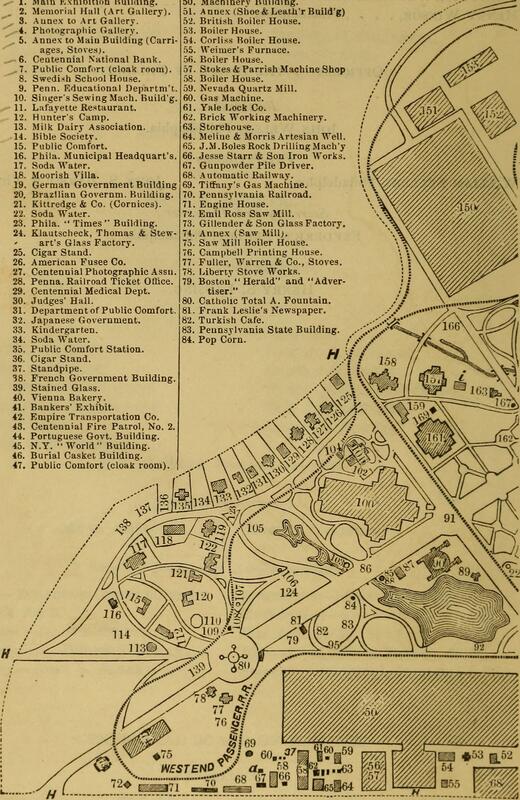 1892 Biographymentions listing of office in Philadelphia, PA, "1892 with an office at 1329 Race Street. Thereafter he disappears from Philadelphia records." 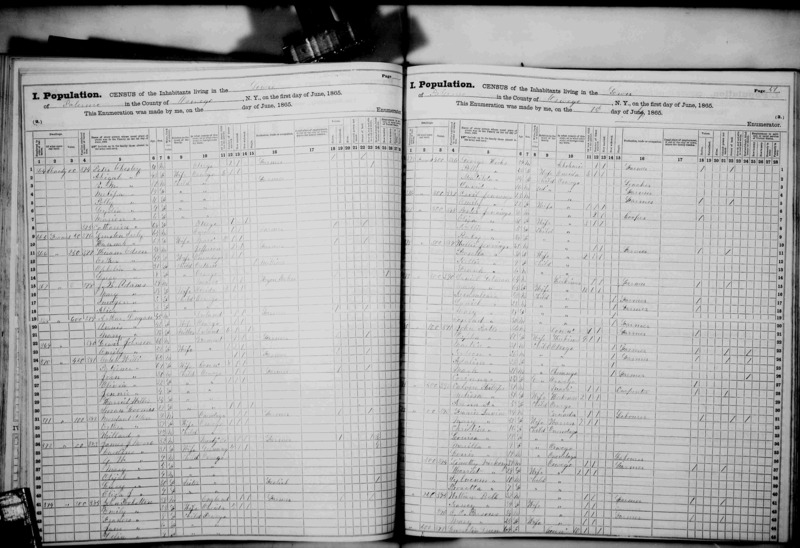 1900 Calvin's wife, Malissa is shown on 1900 Census living with brother in Serbia Town (? ), New York. This would indicate the couple had separated by this point in time. 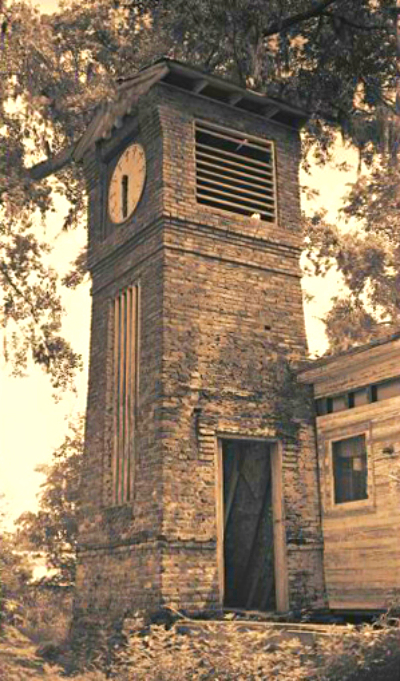 1907 Probable arrival of Calvin C. Phillips in Tallahassee, FL, probable year of purchase of plot for future mausoleum based onarticleby former Governor LeRoy Collins. 1909Second possible arrival date of Calvin C. Phillips to Tallahassee, FL based on statement found in his obituary in the Fulton Patriot. 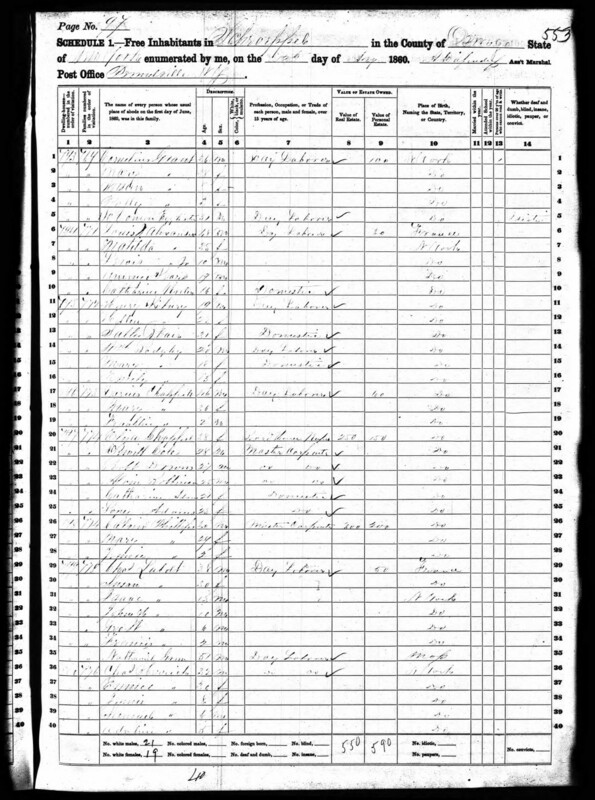 1910 Appears in the 1910 Census, living alone in Tallahassee, FL, occupation listed as Contractor. 1919 Obituaryappears in the Fulton Patriot in New York. This is the obituary mentioning the flags being flown at half-mast here in Tallahassee. Special thanks to Jahongir Usmanov for this information. 1974 Last known photo of Phillips home before demolition. 1985 Article appears in the St. Petersburg Times on October 7, 1985, written by the former Florida Governor, LeRoy Collins, entitled, "A Tale of Man Obsessed With Time". 2000 Phillips' mausoleum broken into and his skull removed. This case remains unsolved. Tallahassee Democrat articleon the event appears, April 26, 2000. 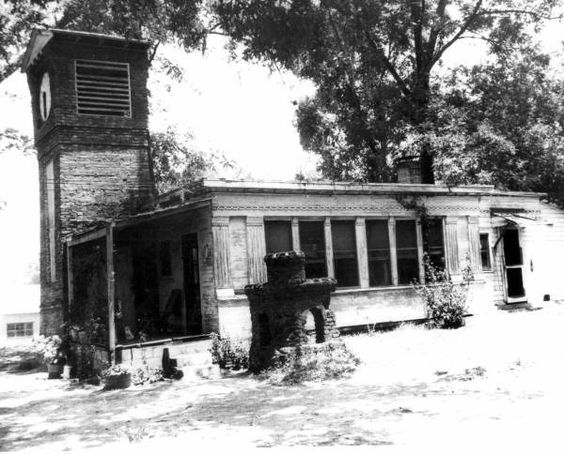 TodayThe lot on which Calvin C. Phillips home once occupied is now the overgrown area above and to the right of the present-day VooDoo Dog located at 805 S. Macomb St. All that remains are few bricks, a set of steps to nowhere and fading drive up into the woodline. Phenomal Place - An entertaining piece about Calvin though riddled with errors though it would really be neat if he had been a vampire and his home just disappeared one day. 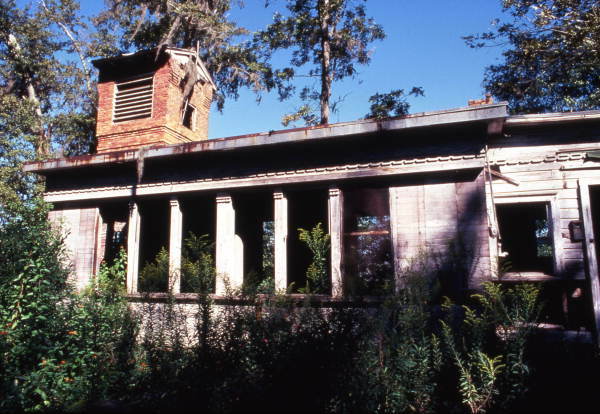 October 31, 2014 Tallahassee Democrat Article- Speaks a bit about the haunted nature of the mausoleum and missing skull, last full article in the Democrat on Calvin. A Tale of a Man Obsessed With Time - reprint of the 1985 article that appeared in the St. Petersburg Times and authored by the former Governor of Florida, LeRoy Collins. One of the best articles ever written about Calvin. Calvin C. Phillips, A Man Obsessed With Time- very well done short video on Vimeo about Calvin done as a project by Kirstin Peterson. Find-A-Grave Site for Calvin - a work of love by a fellow researchers Larry Coltharp and Jahongir Usmanov. We want to extend a big thank you to Jahongir, he was helpful and open to sharing. Florida Memory, Weird Florida Article- great article by Josh, obviously a person who enjoys digging through archives for the forgotten stories lurking there. 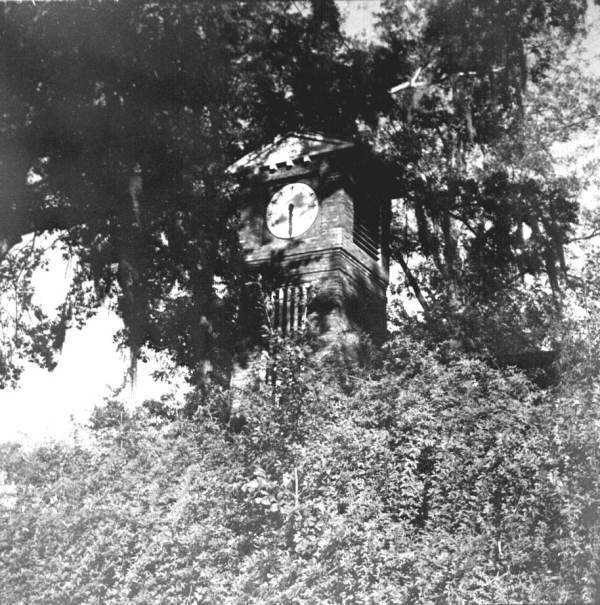 Don Draughon's Collection - some of the best articles into the what the clock tower would have looked like when it still stood. 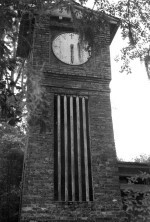 The Ghost Will See You Now - Calvin's story appears in a book of haunted Southern places, unsure how much of the story is fiction and how much fact though Calvin's motivations for constructing the clock tower and mausoleum appear to lost in the mists of time.